← Researching the history of your house? Tracing your family history? Geoff’s illustrated talk will take place just a few days after the centenary of the Battle of Aubers Ridge on the Western Front, in which the 2nd and 5th Battalions of the Royal Sussex Regiment played their parts. The 2nd Battalion, one of the Regiment’s two regular battalions, had already seen much action. However, this was the first major attack in which the 5th Battalion took part. It was part of the territorial force, with its C company in part Lewes-based, and had arrived in France less than three months previously. Both units suffered heavy casualties in the attack, and most of the names of those who died appear on local war memorials. Geoff will explain the context to the battle, its planning and execution, and the casualties sustained. He will focus on the roles played in the attack by the two Royal Sussex battalions. Finally he will talk about four selected casualties from Lewes, and we will learn about their civilian and family backgrounds. The directory noted three Territorial Army units based in Lewes at the start of the Great War. These units, already trained, will have been called into the line at the start of the war. B Squadron (Lewes Troop), of the Sussex Imperial Yeomanry. This cavalry unit was based at the Drill Hall, Ham Lane. Its strength and leadership were not noted. 3rd Sussex unit of the Sussex & Kent Royal Garrison Artillery. Its HQ was at the Depot, Watergate Lane. It was commanded by Capt. F. Loud, and its strength was given as over 70 men. D Company, 5th (Cinque Ports) Battalion of the Royal Sussex Regiment. Its HQ was also at the Drill Hall, Ham Lane. It was commanded by Capt. T.A. Stewart-Jones, and its strength was 110 men. This was set to change with the advent of war. 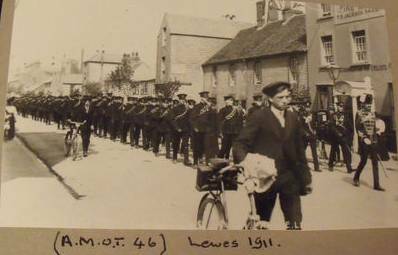 This postcard features soldiers marching through Lewes in 1911. One of many postcards produced by local photographers featuring military units camped on the Downs around Lewes for their summer training. 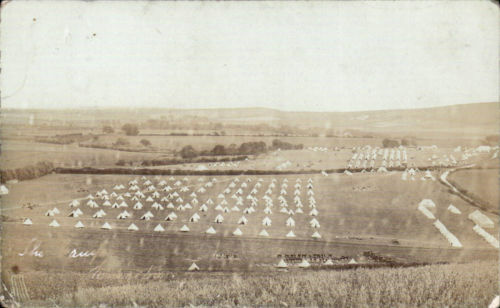 This postcard was produced by J. Cheetham and shows the Camp at Kingston near Lewes. Great Britain declared war on Germany on 4 August 1914. Those regular army units available were promptly despatched to help defend Belgium, and of course the Royal Navy also started to engage the enemy. Research into the names on the Lewes War Memorial has shown that the town suffered its first casualties within weeks. Fourteen local men were killed before the end of the year. Thirty six Lewes men were killed in 1915, more than a third of them on 9 May 1915 when the 2nd & 5th Battalions of the Royal Sussex Regiment took part in the Battle of Aubers Ridge. The casualty rate continued to rise, year on year, until 1918, the most deadly year of all. The first five Lewes men were all killed on the same day, 14 September 1914. Three, Sgt George William Hutson, Pte Sidney Elphick Kenward and Pte Ernest Alfred Pelling, were regular soldiers serving with the 2nd Battalion, Royal Sussex Regt, and died at Vendresse. Also killed that day were Guardsman Cecil Reginald Briggs, 2nd Battalion, Coldstream Guards, on the Aisne, and Cpl George Reuben Relph , Royal Field Artillery, on the Marne. The 1st Battalion, Royal West Kents, also on the Aisne, lost Sgt Bertie Miller on 16 September and L/Sgt Charles Turner 10 days later. In the same month, on 22 September, the cruiser HMS Aboukir was torpedoed off the Dutch coast by the submarine U9, and those lost included two more Lewes men, Petty Officer Thomas Crock (one of four Crock brothers to die in the war) and Gunner Henry Connett of the Royal Marine Light Artillery. There were three more Lewes casualties in October. Pte Dennis Frank Turk of the Royal Lancers and L/Cpl Ernest Townshend of the 1st Battalion, Royal Berkshire Regt, were killed at Ypres on the 21 & 26 October, while on the last day of the month 2nd Lt Harold Osborne Powell, 4th Dragoon Guards, was killed at Messines. The only Lewes man killed in the following month was Chief Stoker William George Ditch, when the battleship HMS Bulwark blew up at Sheerness while at anchor on 26 November. The year’s last casualty was Pte John Short of the 2nd Battalion, Royal Sussex Regiment, killed at La Basse three days after the Christmas 1914 truce. George William Hutson, the son of George William & Frances Hutson, was born at Lewes on 22 December 1889. He joined the Royal Sussex Regiment in 1908, and his prowess as a distance runner was first noted when he beat all comers at a regimental cross-country race. He was an AAA champion of England at both 1 mile and 4 miles, and won many international races. His trophies included two bronze medals at the 1912 Stockholm Olympics, in the 5,000 metres and the men’s 3,000 metres team race. The 5,000 metres final was won by a flying Finn, in a world record time. George William Hutson was a sergeant in the 2nd Battalion, Royal Sussex Regiment, which was sent to Belgium at the start of the Great War. He was killed within weeks, on 14 September 1914. This was a black day for the Battalion, as it lost 59 officers and men, including the commanding officer and a Lieutenant who was the son of the Earl of Chichester. George William Hutson was initially posted as missing in action, as he was wounded and had to be left behind during the Battalion’s retreat. His wife and family were left hoping that he had been taken prisoner. His death was not confirmed until a year later. He married in May 1914, and had a daughter born in August 1914 – in the short gap between his being sent to France and being killed, so he never saw her. His widow, who in 1915 lived at 3 Roseland Cottages, Cliffe, was granted a pension of 16s 0d per week for herself and her daughter. Source: contributors to a Sussex History Form thread, which includes a photograph of G.W. Hutson when running in GB kit and his military record; information confirmed by the FamilySearch website. John Henry & Mary Jane Crock, who lived at 6, Mount Pleasant, lost four sons in the Great War, all remembered on the Lewes war memorial. Petty Officer Thomas Crock (born c.1874) served on the cruiser HMS Aboukir and was lost when it was torpedoed and sunk off the Dutch coast by the submarine U9 on 22 September 1914, just a few weeks after the start of the war. Sergeant William Henry Crock (born c. 1885) was killed in action on 26 June 1917 when serving on the Western Front with a Siege Battery of the Royal Garrison Artillery. Then on 5 September 1918 Lance Corporal George Crock (born c.1882) was killed in action on the Western Front. He was a Scots Guardsman, serving with the Guards’ machine gun regiment. Finally on 13 October 1918 Shoeing Smith Samuel Crock (born c.1876) died in Greece while serving with the Royal Army Service Corps, attached to the Royal Field Artillery. The cause of his death is not recorded, but the Spanish Influenza began its ravages in that month. Hugh C. Woodroffe of Highfields, The Wallands, also lost three brothers in the war. All three were officers, educated at Marlborough College, all served in the Rifle Brigade, and all were mentioned in despatches or awarded medals for gallantry. Lieutenant Kenneth Herbert Clayton Woodroffe, serving with the 2nd Battalion, Welsh Regiment, was killed at Aubers Ridge on 9 May 1915, an engagement in which the 2nd and 5th Battalions of the Royal Sussex Regiment also suffered many casualties. He was 22, and had played first class cricket for Hampshire, Cambridge University and Sussex. A few weeks later, on 30 July 1915, his younger brother Second Lieutenant Sidney Clayton Woodroffe, of the 8th Battalion, the Rifle Brigade, was killed in action during the Battle of Hooge, aged 19. His conspicuous gallantry in this battle resulted in the posthumous award of the Victoria Cross. A year later their elder brother Captain Leslie Woodroffe, M.C., also of the 8th Battalion, the Rifle Brigade, died of wounds at the age of 31. Dutch historian Sander Woonings contacted the Lewes History Group website in December 2014 seeking information about Lewes-born Flying Officer Claude Mervyn Wheatley, who was killed on 22 March 1940 (Good Friday) when his unarmed Spitfire N3069, one of two allocated to the RAF’s first operational aerial reconnaissance unit, was shot down and crashed near the Dutch village Herwen, Sander’s childhood home. Sander has reconstructed the story in over 20 years’ research. F/O Wheatley, posted to the unit a month previously after previous experience in 105 Squadron, took off from RAF Heston on a mission to photograph the Ruhr. The plan was to fly at 33,000 feet, higher than German planes were thought capable of achieving. His plane was detected by radar and two German officers were despatched to intercept it in their Me-109s. For both German pilots this was their first mission of the war but one pilot, Leutnant Harald Jung, managed to get within range. F/O Wheatley baled out, but his parachute pack had been hit in the attack and never deployed. Flying Officer Wheatley, the reconnaissance Spitfire in which he was killed and Leutnant Harald Jung, who shot him down. Claude Mervyn Wheatley was born at Lewes on 5 October 1913, the son of Ernest Albert & Marion Wheatley. He had married at Worthing in February 1939. The 26 April 1940 Sussex Express carried a notice that Flying Officer Claude Mervyn Wheatley, aged 26, had been killed in action on active service, after initially being reported as missing. It noted that his father Ernest Albert Wheatley was the proprietor of the Lewes firm of Browne & Crosskey, drapers and furnishers. Local directories show that Mr Wheatley had run Browne & Crosskey for many years, living over the shop at 214 High Street. A report of the funeral at the Lewes Methodist Church (Station Street) of a Great War soldier whose father had been a long-serving Browne & Crosskey employee notes that Mr E.A. Wheatley had played the organ. Browne & Crosskey was at that time run by his father, Albert Wheatley. Source: initial information from Dutch local historian Sander Woonings, with further more detailed information in which F/O Wheatley met his death on the website: www.arga-nl.nl/pages/herwen_spitfire_uk.html. Information about F/O Wheatley is from FamilySearch, the British Newspaper Archive and other websites. “The first bombs fell in Lewes on 29 September 1940, when during an air battle over the town five were dropped in the Malling Down area. There were no casualties and very little damage, the bombs falling in open country. On 4 October 1940 just before 10 a.m. the town was shaken by a bomb exploding at Southerham near the river bank. Next day a string of bombs fell across the town at 9.30 a.m., from Cliffe Hill to the Cattle Market and between Southover churchyard and the railway line to Brighton. Eight bombs were accounted for, in addition to two delayed action bombs, one on Chapel Hill and the other in the corner of Southover Grange. The one in Chapel Hill was removed; the other sank lower and lower in the soft ground with the Winterbourne Stream running close by and was later covered with concrete. It was a miracle there were no casualties and the damage was very light. The county town had its worst experience about 12.40 p.m. on Wednesday 20 January 1943, when four enemy fighter bombers flying very low dropped six high explosives on the town and also attacked with machine guns and cannon fire. Bombs were dropped in Brook Street, at the top of North Street, West Street, New Road and St Martin’s Lane near the entrance to the tunnel under the town. Two were killed and many injured, there was much damage to property and a fire in the evening completely destroyed the Stag Hotel in North Street and adjoining property which had been damaged by the bombing. 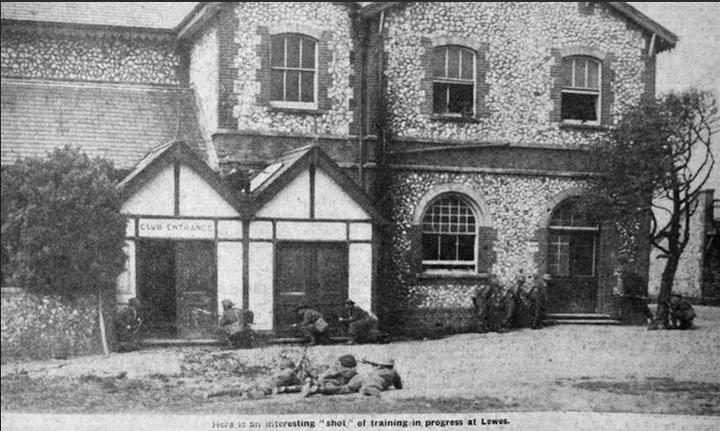 A big thank you to everyone who came up with suggestions for the identity of the flint building featuring in the 1942 Home Guard photograph from the Sussex Express. Having looked at photographs of all the suggested locations, we have a positive match. And the winner is…. Colin Brent, who suggested it was a building at the racecourse. Confirmation comes from a Reeves photograph featured in Lewes History Group Bulletin 38, of the 1874 race stand. The flint and brick style matches, particularly around the windows and the cross pattern in the brickwork of the central, between-floors band around the building. 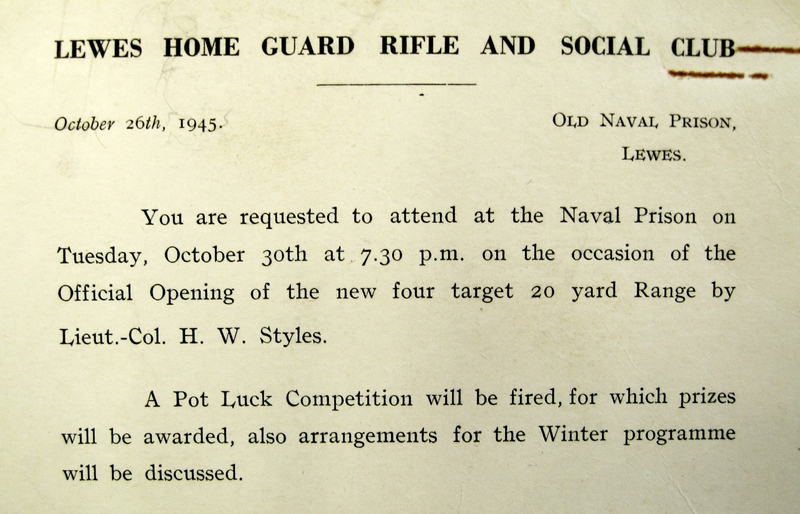 This entry was posted in Lewes, Local History, Military History. Bookmark the permalink.